Published in the Dover Express, 7 November, 1980. An old farmhouse stood at the corner of Stepping Down path, the lower part of which has long been known as Cow Lane. This was called Priory Farm to keep alive the name of the farm that once existed where Dover College now stands. Mr Henry Adams' dairy was further up the valley. For many years these two remained the only forms of commercial enterprise in this direction. The population of the valley had stood at a low level for centuries. The tithes of Siberston, in the Elms Bottom, had been held by the Priory of St Martin, but after the dissolution of the Priory these corn lands passed to John Monins, Lieutenant-Governor of Dover Castle. Part of it went to Mr Thomas Pepper, Jurat, in the reign of Elizabeth; and that part, later, was acquired by Mr Phineas Stringer, of Dover, and became attached to the Manor of the Elms. Part of the land, however, remained the property of the Monins family until its utilisation as building land, and Monins is the name of one of the streets. When this book was written, in 1906, there were 50 houses, in terraces, or detached and semi-detached, fronting on to Elms Vale Road, not counting the farm which still existed at that time. On the south side there was nothing beyond the Crown and Sceptre public house. On the north side there were vacant spaces between Eaton Road and Chevalier Road but nothing beyond house No. 118. On each side of the road houses of modern post-war type have been erected by private enterprise up to what used to be dairy farmland but which later became a council tipping site and then, since the Second World War, a recreation ground. Prom the north side of Elms Vale Road there are six streets running in the general direction of Tower Hamlets. The third of these, Eaton Road, followed the line of an ancient footpath, which formerly passed through a corn field opposite the farm; and, beyond the end of the street, the path continued to serve as a short cut to Charlton through Tower Hamlets until it was merged in Astor Avenue. In addition to the path from Elms Vale to Tower Hamlets, there is another shown on the Ordnance maps, from Eaton Road to the top of Whinless Down, where it joins a cart road to West Hougham; but the public right of way from Eaton Road up to Whinless Down is disputed. On the west side of Elms Vale, under Stepping Down stands St Martins School in Markland Road, a turning off Church Road which is the link between Folkestone Road and the Elms Vale Road. The school was built in 1903 by an organisation known as the Dover Church Schools Company which was formed prior to the passing of the Education Act of 1902. Its object was to provide for the pressing educational needs of this growing district with a Church of England school. This effort provided good accommodation for 700 scholars. The Act of 1902 established the Dover Education Committee and the school was taken into public ownership by the town in 1907. Maxton is a new part of Dover that has sprung from an ancient root. Its modern extension has reached over into Elms Vale, but its historic associations were in Folkestone Road. Maxton Court was one of the ancient Manors of Hougham. The ownership of the Maxton Manor can be traced from the time of Henry III, when it was held by Sir Stephen Manekyn, for knight's service in the defence of Dover Castle. Manekyn’s daughter Alice alienated it to William Archer who, at that time, was the chief of the twenty-one Dover master mariners who provided the twenty-one ships for the King’s service, and for working th monopoly of the passage between Dover and Calais. His son William passed the estate to John Alkham, of Alkham, whose descendants held it until the close of the reign of Edward IV, when it passed to Roger Appleton: and after his day it was held in succession by the Hobdays, the Harmans, the Hales and, ultimately, it went to the Andrews family, one of whom was Mayor in the reign of Elizabeth. The Andrews sold it to the Peppers, who held it till the reign of James I and then sold it to Sir Thomas Wilford, of Ilden. In the reign of Charles I It passed to the Richards, of Dover, and from the Richards it passed to John Sladden, merchant adventurer, of Dover, and it was carried by his daughter Mary in marriage to Mr Thomas Fogge, of Dover. The Fogges, in course of time, sold it, and in 1783 it was owned by Mr Thomas Biggs, Inland Revenue officer, of Dover, which resided there and improved the mansion. In the early part of the 19th century it was the residence of the Worthingtons, of Dover. Dover, The Fogges, in course of time, sold it, and in 1783 it was owned by Mr Thomas Biggs, Inland Revenue officer, of Dover, who resided there and improved the mansion. In the early part of the 19th century it was the residence of the Worthingtons, of Dover. Later, in the 1890s, the manor house, which stood just beyond the old tram terminus, now a council garage adjoining the Orange Tree public house, became the home of a Mr Dawes, who ran the Diamond Brewery for a time and also had the Diamond Stores next door. An old barn believed to have been used to house the brewery drays, still stands, set back from the road at the side of the Diamond Brewery Stores and off-licence. Another building at the rear, used until recent years by Whitbreads, was the old granary of the brewery. The Diamond Brewery had a succession of owners, including T. Phillips and Co., who took over from Mr Dawes, and Allen and Co. The site of the manor house, which was demolished in the first half of the 20th century, is now occupied by a petrol filling station. Maxton 90 years ago, with the old manor house on the left and the Diamond Brewery in the centre. E. Dawes and Sons’ brewery sign on the left spans the yard which still exists between the Diamond Stores, in Folkestone Road, and the premises occupied until recent years by Mr Hector Langford, the newsagent. The gently sloping roof of the building on the right is that of a barn which has long been used as a garage but once housed the brewery drays. 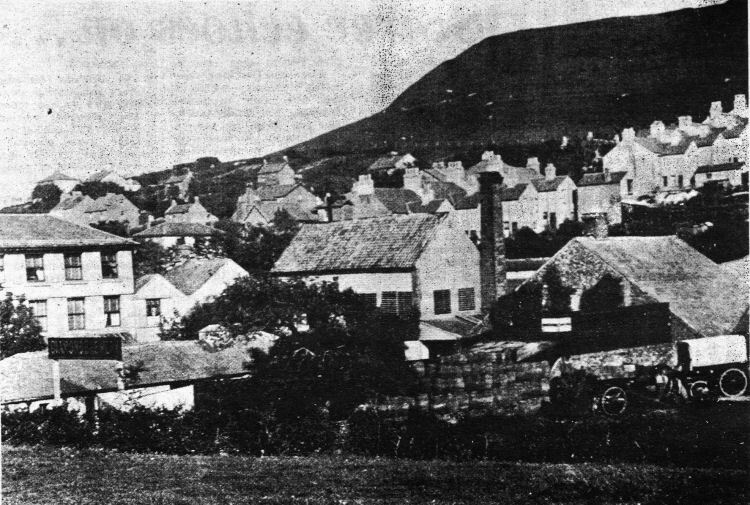 Two of the drays are visible on the right of the picture which was taken by Whorwell, of Bench Street, and published in the Dover Standard’s illustrated visitors’ list in the 1890s. 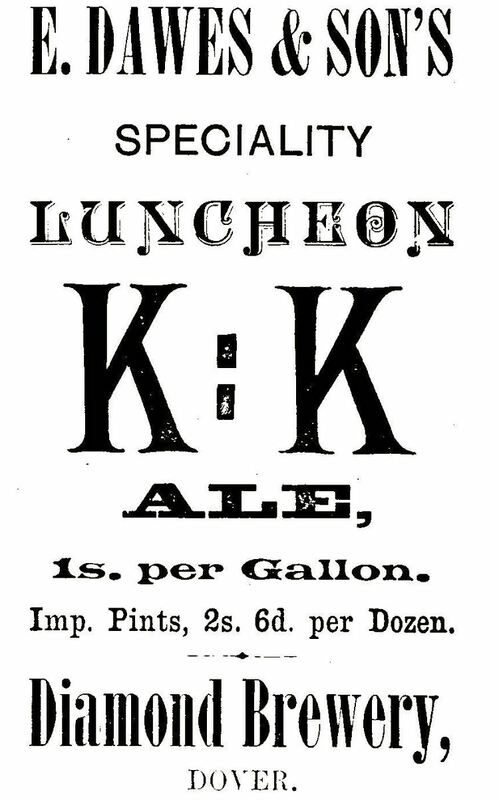 In their 1890s advertisement, reproduced above, Dawes and Sons offered their speciality — a luncheon ale costing one shilling a gallon!